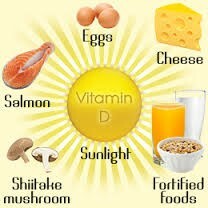 Though we obtain some of our vitamin D from dietary sources (most often fortified foods), most is made in our bodies through sun exposure. In Canada, a lack of direct sunlight in winter means we don’t typically get enough exposure to make adequate vitamin D from October to April. SPF 15 sunscreen reduces D synthesis by 99%. Cholesterol-lowering medications – having too-low cholesterol impairs the body’s ability to make vitamin D.
Certain health conditions are associated with dramatically reduced stores of vitamin D3 and show benefit from significant supplementation. The blood test for Vitamin D3 costs ~$35 – speak to your MD or Naturopathic Doctor today to request testing!